Aerospace Engineering Honors student and senior Lauren Trollinger was awarded the Women in Aerospace (WIA) Foundation—American Institute of Aeronautics and Astronautics (AIAA) Digital Avionics Scholarship at the at the 29th Annual Women in Aerospace Awards Ceremony and Banquet held October 29th in Arlington, Va. Annalisa Weigel, President and Co-founder of the Fairmont Consulting Group and Director of the Women in Aerospace Foundation was on hand to present the award. Trollinger is very involved at the Clark School. 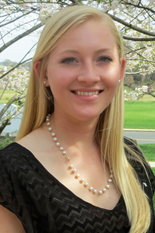 She serves as president of the AIAA student chapter and is an active member of the engineering sorority Alpha Omega Epsilon. Trollinger, who is also pursuing a minor in Project Management, works with Dr. Alison Flatau, a WIA award winner herself (2010 Aerospace Educator Award), in the Flow Visualization Laboratory. She works on researching the drag-reducing effects of synthetic jet actuators, and hopes to apply her research to rotorcraft aerodynamics in graduate school. "The WIA Awards Ceremony was so much more than I had ever anticipated—the women being recognized for their achievements are literally the most inspiring leaders and outstanding educators in aerospace, and getting to hear their stories was extremely motivational. The networking opportunities you get from being a part of such a prominent organization is a very powerful thing. Over dinner, I talked to John Logsdon, a former space policy professor at GWU. The next day, I noticed “Space Expert, John Logsdon” was quoted in AIAA’s daily news. Every person in that room was the most successful and most knowledgeable person in his or her area of expertise. I am so grateful for the opportunities that the Women in Aerospace Foundation and the AIAA Digital Avionics group have given me, and to Dr. Flatau and Dr. Chopra for keeping up with my constant requests for letters of recommendation!" Established in 2009 through the tremendous efforts and contributions by the WIA board, the WIA Foundation provides scholarships to women pursuing undergraduate technical degrees to encourage them to enter careers in the aerospace field. Trollinger was joined at the event by fellow scholarship recipient Emily Zimovan, a senior in Purdue’s space program and former University of Maryland Aerospace Engineering Honors undergrad.